"United States Centers for Disease Control and Prevention confirmed that the same virus was also isolated from stool specimens of two healthy children from the same community"
The National Department of Health of Papua New Guinea and the World Health Organization (WHO) today confirmed that the strain of poliovirus first detected in a child from Morobe Province in April is now circulating in the same community. The one confirmed case is a 6-year-old boy with lower limb weakness, first detected on 28 April 2018. A vaccine-derived poliovirus type 1 (VDPV1) had been isolated as the cause of the paralysis on 21 May 2018. On 22 June 2018, the United States Centers for Disease Control and Prevention confirmed that the same virus was also isolated from stool specimens of two healthy children from the same community. This means that the virus is circulating in the community—representing an outbreak of the virus. The NDOH has formally informed WHO and has been working with WHO and other partners in launching a response. Some of the immediate steps include conducting large-scale immunization campaigns and strengthening surveillance systems that help detect the virus early. These activities are also being strengthened in neighbouring provinces. Papua New Guinea has not had a case of wild poliovirus since 1996, and the country was certified as polio-free in 2000 along with the rest of the WHO Western Pacific Region. In Morobe Province, polio vaccine coverage is low, with only 61% of children having received the recommended 3 doses. Water, sanitation and hygiene are also challenges in the area. Outbreak response activities are ongoing in Morobe Province. Experts from the NDOH, Papua New Guinea’s Central Public Health Laboratory, Provincial Health Authorities and WHO have conducted field missions to undertake clinical investigation, house-to-house surveys, sample collection and contact tracing. The team also collected stool specimens from family members of the patient and from the community. A “mop up” immunization campaign was done in the community targeting children under 15 years old. To date, 845 children from the Lufa Mountain Settlement have been vaccinated. Oral polio vaccine (OPV) contains an attenuated (weakened) vaccine-virus, which activates an immune response in the body. When a child is immunized with OPV, the weakened vaccine-virus replicates in the intestine for a limited period, thereby developing immunity by building up antibodies. During this time, the vaccine-virus is also excreted. In areas of inadequate sanitation, this excreted vaccine-virus can spread in the immediate community (and this can offer protection to other children through ‘passive’ immunization), before eventually dying out. On rare occasions, if a population is seriously under-immunized, an excreted vaccine-virus can continue to circulate for an extended period of time. The longer it is allowed to survive, the more genetic changes it undergoes. In very rare instances, the vaccine-virus can genetically change into a form that can paralyze—this is what is known as a circulating vaccine-derived poliovirus (cVDPV). Because of relatively limited travel to and from this area and the planned immunization activities, WHO assesses the risk of international spread of the cVDPV from Papua New Guinea to other countries to be low. However, it is important that all countries—in particular those with frequent travel and contacts with polio-affected countries and areas—strengthen surveillance for cases of AFP to rapidly detect any virus importation and facilitate a rapid response. Countries, territories and areas should maintain high immunization coverage to minimize the consequences of any new virus introduction. 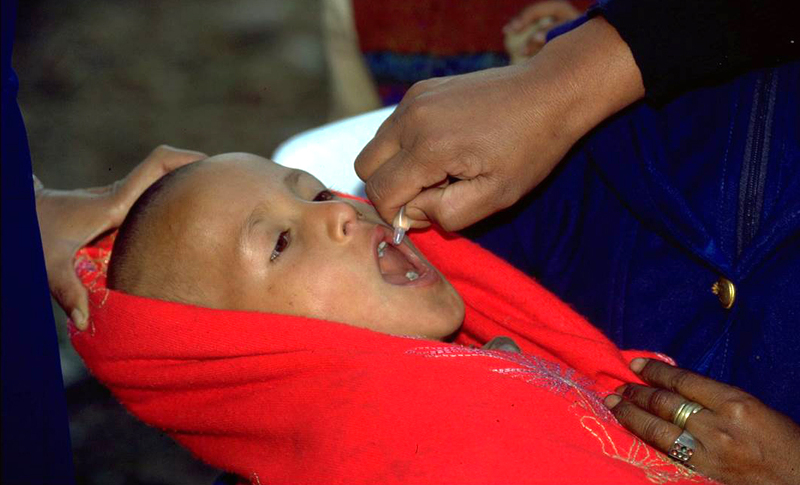 WHO recommends that all travellers to polio-affected areas be fully vaccinated against polio. Residents (and visitors for more than 4 weeks) from infected areas should receive an additional dose of OPV or inactivated polio vaccine (IPV) within 4 weeks to 12 months of travel.